I calculate monthly Net Earnings Revisions Indexes (NERIs) for all of the S&P 500 sectors and industries and most of the MSCI global stock indexes. These NERIs are three-month moving averages of the number of forward earnings estimates that are up less the number of them that are down as a percentage of the total number of forward earnings estimates. Looking at these NERIs around the world, we can see lots of downward revisions through February. I believe they are consistent with subpar global economic growth. (1) World NERI was -5.9 during February, the lowest since December 2012. It has been negative for the past 32 months. (2) S&P 500 NERI also turned more negative in February, to -6.6, the lowest since January 2013. Guidance provided during the Q4-2013 earnings season caused analysts to reduce their estimates for the first quarter and all of 2014. (3) Europe NERI fell to -11.0 this month, the lowest since December 2011. It’s rather odd that this index is so weak given the solid improvements in the region's M-PMIs and NM-PMIs. (4) Emerging Markets NERI declined from -3.0 last month to -5.3 this month. It has been negative since March 2011. (1) Jobs are more plentiful. I am especially fond of the survey’s series tracking the responses to questions about whether jobs are plentiful or hard to get. The former jumped to 13.9% this month from 12.5% in January. That may not seem like much, but it is the best reading since June 2008. The percentage of respondents agreeing that jobs are hard to get fell to 32.5%, the lowest since September 2008. (2) More jobs are boosting confidence. I found that the CCI’s present situation component is highly correlated with the difference between the jobs-plentiful and the jobs-hard-to-get series. In other words, jobs drive consumers’ confidence about their current well-being. (3) Survey response is confirming falling jobless rate. There is even a better correlation between the official unemployment rate and the jobs-hard-to-get series. We all know that the unemployment rate has dropped during the current economic expansion, mostly because of a sharp decline in the labor force participation rate. If people are dropping out because they are discouraged by the lack of jobs, then the jobs-hard-to-get series should not be falling in lock-step with the unemployment rate. But it is suggesting that labor market conditions really are improving and that other factors are behind the falling participation rate. So far, Abenomics has succeeded in stopping deflation and actually boosting price inflation. However, the jury is still out on whether it is ending Japan’s economic stagnation. It still could backfire if wages aren’t raised by at least as much as the increase in consumer prices. What we know so far is that December’s CPI inflation rate was 1.6% y/y, the highest since October 2008. The core rate (excluding food and energy), which had been negative from January 2009 through August 2013, was up but by only 0.7% during December. Unfortunately, much of the “improvement” in the headline rate has been in food and fuel prices as a weaker yen increased the domestic prices of imported commodities. Japan’s trade deficit widened dramatically last year through January as overall import costs soared, while exports weren’t boosted by the weaker yen as much as expected. Even after adjusting for inflation, Japan’s imports increased during each of last year’s four quarters, while exports actually turned weaker during the second half of the year. That weakness contributed to the fourth quarter’s disappointing 1.0% (saar) gain in real GDP. Much will depend on the spring wage negotiations, a tradition since the 1950s, during which big manufacturers set wage trends for the rest of corporate Japan. The 2/19 WSJ reported that employers may be willing to hike wages and bonuses to stimulate the economy, as requested by the government. I don’t expect that the gains will do much more than offset price increases over the past year. (1) Growing. Markit released January’s HSBC Emerging Markets Composite PMI on February 10. Despite all the unsettling headline news about EMs, the index remained above 50.0 at 51.4, down slightly from December’s 51.6 and the sixth consecutive reading above 50.0. The press release noted that manufacturing remained stronger than services. (2) Lagging. The Emerging Markets MSCI (in dollars) has been underperforming the All Country World MSCI since their October 2011 lows. Since then, the former is up only 15.4%, while the latter is up 54.4%. (3) Cheapening. The underperformance of the EM MSCI since the summer of 2011 is largely attributable to its forward P/E, which has been moving sideways around 10.0. Over the same period, the World P/E is up more than 30% (to 13.9), led by a 50% increase in the US (to 15.3). (4) Flat-lining. The EM MSCI stock price index also has been moving sideways with some volatility since the summer of 2011, along with both the CRB raw industrials spot price index and the price of a barrel of Brent crude oil. The close relationship between these three variables suggests that the EM MSCI is likely to continue underperforming as long as commodity prices remain flat. That’s the most likely outlook this year if global economic growth remains subdued, as I expect. (1) Global oil demand rose to a record 91.2mbd last month. However, the growth rate fell to 1.0% y/y, the slowest since September 2012. (2) Emerging economies must be slowing, as evidenced by the drop in the growth rate in their demand for oil from a recent peak of 3.5% a year ago to 1.5% this January, the slowest since October 2009. (4) US oil usage has been rising over the past year after mostly falling since the spring of 2007. In Europe, it has stopped falling over the past year after mostly falling since 2006. Interestingly, within Europe, it is still falling in Italy and Spain, while it is edging higher in Germany and the UK. (5) China’s oil demand has stalled at a record high around 10mbd over the past seven months. Oil usage rates in Brazil and India continue to rise to new highs, though the pace of ascent may be slowing. (1) Social financing. During January, China’s broadest measure of lending, a.k.a. “total social financing,” rose 2.58 trillion yuan, slightly exceeding the previous record high a year ago. In recent years, there has been a tendency for lending to surge in January just before the start of the Lunar New Year holiday. Nevertheless, over the past 12 months, social financing has increased by a near-record $2.80 trillion. (2) Bank loans. January’s surge in social financing was led by a 1.32 trillion yuan ($216 billion) jump in bank loans. This is the largest one-month increase since January 2010. Over the past 12 months, banks loans are up $1.5 trillion, the most since October 2009, when the Chinese were still scrambling to recover from the global financial meltdown. My assessment is that China’s real GDP will continue to grow around 7.5% with no immediate threat of a hard landing. Deflationary forces will be offset by the provision of lots of credit. However, China may have reached the tipping point where more credit is losing its effectiveness in halting deflation and stimulating growth. This is a long-term problem that many other countries are facing today. For any economy, credit is gold until it turns into lead. Several times in the past, I’ve referred to Fed Governor Janet Yellen as the Fairy Godmother of the bull market. I supported this notion with a chart showing that the S&P 500 has tended to rise more often than not after she gave a speech on the economy and monetary policy. Now that she is the Fed chair, she did it again last Tuesday with her congressional testimony. Investors have gotten over their taper tantrum of last summer. Now tapering is bullish because it shows the Fed’s confidence in the economy. Either that or it shows that the FOMC has lost confidence in the efficacy of QE and would rather replace it with ultra-easy forward guidance about the federal funds rate. That’s my assessment of what’s driving the Fed. Both stock and bond investors seem to be adjusting to more forward guidance with vanishing QE. Europe’s economic indicators have been improving over the past year, especially in the UK, where the economic rebound has been surprisingly strong. The Eurozone indicators have been signaling a recovery since last summer, but a very weak one. Yet European stock markets have rallied strongly over the past year, led by the ones in the Eurozone’s peripheral countries. Unfortunately, forward revenues isn't as upbeat. It’s been falling over the past year in the UK. Furthermore, the UK's forward profit margin has declined sharply over the past three years, which has depressed forward earnings over that period. That might explain why the forward P/E is relatively low at 12.5, which is a 7% discount to the world. The forward revenues of the EMU MSCI is also falling, and has been doing so at a faster pace recently, suggesting that the region may be especially hard hit by weaker growth among emerging economies. The only good news is that the forward profit margin seems to have bottomed early last year and is recovering slowly. With the forward P/E at 12.9, the region is selling at a 4% discount to the world. I am skeptical that the Eurozone’s economic indicators and MSCI fundamentals justify higher valuation multiples in the region given that they have rebounded back to the previous highs during 2009. The latest mini-correction was triggered by anxiety over an emerging markets crisis, which some feared had the potential to turn into a global contagion. I argued that the crisis would be contained to the Fragile Five, and wouldn’t morph into another Lehman-style financial calamity. The Emerging Markets MSCI (in dollars) has been highly correlated with both the CRB raw industrials spot price index and the price of a barrel of Brent crude oil. While the EM MSCI is down 5.0% ytd, it is encouraging to see that commodity prices remain surprisingly stable. That suggests that the global economy is carrying on. I am a fan of the OECD’s monthly leading indicators. The only problem is that their release is delayed by the time necessary to collect and compile the data. So here we are in the second week of February with the leading indicators released for December just yesterday. However, leading indicators are supposed to lead by three to six months, so they are still relevant, in our opinion. (1) Advanced economies advancing. Most encouraging is that the composite leading indicator for all of the 34 members of the OECD rose to 100.9, the highest level since February 2011. That confirms the upbeat readings of the more volatile JP Morgan Global Composite Output PMI, which remained upbeat during January at 53.9. Over the past year, there have been steady monthly gains in the indexes for the US, Europe, and Japan. The same can be said about all the major economies of Europe and the peripheral ones too. (2) Emerging economies submerging. The OECD also compiles leading indicators for the BRICs. They remained depressed during December, with India falling to a record low. I’ve noticed recently at my local CVS Pharmacy that there are three cash registers but only one person operating one of them. The other day, I was surprised when this person offered to help me to check out using the self-service barcode scanner rather than do it for me at her register. The message is “do it yourself.” This is just one of many examples of how businesses are using technology to reduce their headcount. This is one of the main reasons why employment gains have been subpar during the current economic expansion. Friday’s employment report for January, which included benchmark revisions, didn’t alter this picture. There are lots of numbers in this report and, once again, they were all over the place with some surprisingly strong and others surprisingly weak. Once again, I cut through all the noise by calculating our YRI Earned Income Proxy, which is simply aggregate hours worked times average hourly earnings in the private sector. 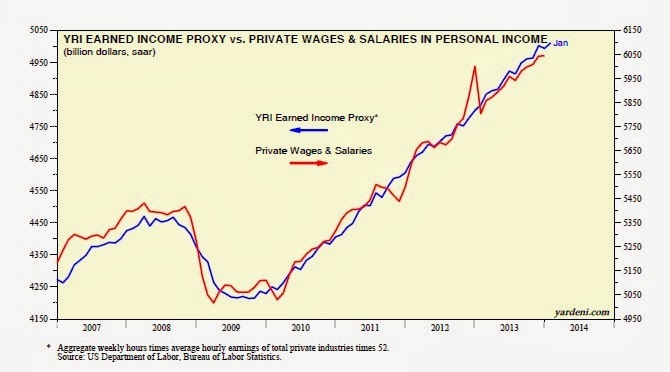 It is highly correlated with both wages and salaries in the private sector and retail sales. It rose 0.3% during January to yet another new record high. In addition, there are five employment measures that we monitor to keep us confused. They certainly did their job in January: Payroll employment (up 113,000), private payrolls (142,000), household employment (638,000), household measure comparable to payroll measure (901,000! ), and the ADP measure of private payrolls (175,000). Our assessment is that the labor market continues to improve at a subpar pace. Private payrolls are finally back, matching the record high during January 2008. And knowledge workers are putting knowledge workers out of work too. Payroll employment in all information industries peaked at a record 3.7 million during March 2001. It dropped to 2.7 million during mid-2010, and has remained around that level since then. The plunge in valuation multiples since January 15 is reminiscent of similar downdrafts during previous corrections of the current bull market. 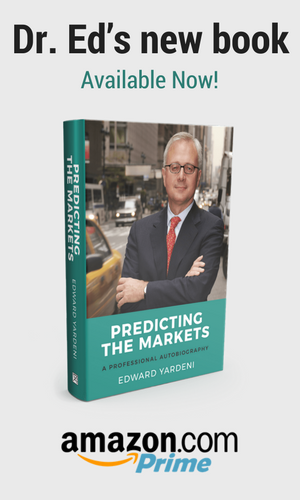 There are many valuation models, but most strategists agree that P/Es are significantly influenced by the prospects for interest rates and earnings growth. I focus on the Aaa-rated corporate bond yield (compiled daily by Moody’s) and analysts’ consensus expectations for S&P 500 earnings growth over the next five years (compiled by Thomson Reuters I/B/E/S). I find that the trends in the spread between these two important variables are similar to the trends in the forward P/E of the S&P 500. The bond yield has been edging lower this year, while growth expectations remain relatively high around 11%-12%. Given recent developments among emerging economies and some weaker-than-expected indicators for the US and Europe, investors seem to be reassessing the prospects for earnings growth and reducing the valuation multiple they are willing to pay for earnings in a slower-growing world. I think investors may be overreacting to some of the weak indicators, particularly January’s M-PMIs for China and the US. Interestingly, J.P. Morgan’s Global PMIs remained near recent cyclical highs during January for the composite (53.9), manufacturing (53.0), and services (53.8). So far so good: Commodity prices suggest that the global economy is holding up well despite the latest emerging markets crisis. This confirms that the crisis remains contained mostly to the F-5 and isn’t morphing into a contagion--so far, knock on wood. I construct a YRI Global Growth Barometer by simply averaging the price of a barrel of Brent crude oil with the CRB raw industrials spot price index. Our YRI-GGB registered 106 on Monday. It has been fluctuating around this level for the past two years. Both components are very sensitive indicators of global economic activity. Both are holding up remarkably well given the headline news about the EM crisis and the strength of the dollar, which tends to depress commodity prices. Despite interest rate hikes announced last week by the central banks of India, South Africa, and Turkey, the currencies of these countries remained weak. The Russian ruble tumbled. Argentina’s currency continued to plunge. These currencies have been weak since last spring, when Fed officials started to talk about tapering QE. So the crisis didn’t just start in January. However, it may be premature to say that it is almost over. Nevertheless, it may soon be over as far as the stock markets in the US, Europe, and Japan are concerned. That’s because Debbie and I don’t expect a contagion. The trouble spots are troubled by their own unique circumstances and will have to work them out on their own. The global economy has been weathering several storms in recent years. The first storm, during 2008, was US-centric and depressed the global economy. The second storm, from 2010-2012, was centered in the Eurozone and dampened global economic growth. Now, the third storm is hitting a number of emerging economies, but shouldn’t slow the global economy much given that growth is picking up in the US, Europe, and Japan.